County Mayo (“Plain of the yew trees”) is a county in the western side of Ireland. 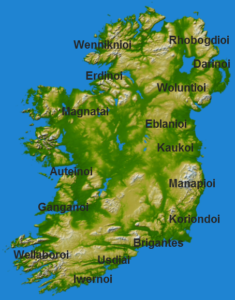 It is part of the province of Connacht and is named after the village of Mayo, now generally known as Mayo Abbey. Mayo County Council is the local authority for the county. The population of the county was 130,638 at the 2011 census.The boundaries of the county, which was formed in 1585, reflect the Mac William Íochtar lordship at that time.